A return to Eastern European baking with a wonderful cake, which is simple to make, delicious - a confection of eggs, nuts, chocolate and sugar - and actually quite spectacular. For people logging in just for the recipe, it’s about two thirds of the way further down this blog post. Thanks to all our supporters and backers, I’m overwhelmed as I write this, but there’s no resting on our laurels. Because with Kickstarter, if you don’t meet your target, you lose the lot! You can go there to pre-order your copies of our book. That enables us to fund the printing, and you will have the book by April 2019, in time for Mother’s Day. Here’s a 40 second sneak peek of our Kickstarter video. We’re re-posting this recipe and story, because both belong to Melbourne grandmother Marysia Segan, who is on the cover of our book, with her sister Eve and granddaughter Louise. Marysia’s life story is a meditation on memory. What do you remember from a painful experience, what do you block, what do you slowly allow to emerge? And I do mean slowly. Marysia tried for decades to recall the name of a Polish family who had sheltered her during World War Two. It was only when she was 85 years old that Marysia was ready to go back in time, to the the last time she saw her mother, aged twelve. Marysia Segan is now aged 89, and when we photographed her in Melbourne 3 years ago she had just begun chemotherapy treatment. But she was still bright, forthright, no-nonsense, energetic, on top of things – and looking well. “Yes, that's what everyone says to me -- you don’t look sick,” Marysia said then. Now she has returned to good health and wonderful overseas trips with family. Maria Bierzynski, known to everyone as Marysia, was born in 1930 in Zabierzow, a small village near picturesque medieval Krakow, arguably the most beautiful town in Poland. She was the young tom-boy daughter of the village doctor, Henryk Bierzynski, and theirs was a secular Jewish household. They didn't speak Yiddish; in fact Marysia spoke Polish like a country girl. That accent and her “non-Jewish” looks helped to save her life. When the Nazis invaded Poland that life ended. Schooling was halted by German decree. Restrictions on Jews were implemented, then tightened. By 1942, when Marysia was 12 and her older brother Jan 16, her father was organising forged Polish papers so he could move his family to Warsaw. He hoped the anonymity of the capital city would protect them. In Zabierzow everyone knew their respected local doctor was Jewish. The escape was planned in stages. First they moved to the nearby village of Bedkowice, where a Christian family ran a guesthouse and accepted (and sheltered) Jews. There were several other Jewish families there, and Marysia was befriended by the children of the guesthouse family who were closest to her in age, Janina and her brother Lech, known as Leshek. Lech (Lleshek) with Marysia, Bedkowice, 1942. Janina is not in this picture. One summer morning, in July 1942, Marysia’s mother Regina looked out the window and saw a convoy of German police racing up the guesthouse driveway. Reacting quickly, she gave Marysia a backpack with some food and money inside, and sent her out to the forest. “Don't come back till they've gone and it's safe,” were her mother's last words to her. Regina remained upstairs. One of the police checking their ID papers was a local man, a Pole working for the Germans. He recognised Regina's surname, and knew that her husband was the doctor from Zabierzow. At that time, Jews could only leave their villages with a permit. Regina didn't have a permit. Just then, Marysia’s brother Jan entered the house. He’d been swimming in the river. A different policeman checked his papers and didn't recognise the doctor’s name. And so Jan was spared that day. He was allowed in to go in to get his bike and Regina managed to tell her son that Marysia was hiding in the forest, and that he should look for here there. Regina thus helped to save both her children that day. The police began searching the house. They pulled up floorboards and discovered fur coats. Trading in furs was also forbidden to Jews. They arrested nine people, including Marysia’s mother. Marysia’s brother found her in the forest. It was now too dangerous to return, so they waited till nightfall and walked the 11 km back home through the fields to reach their father. Henryk said they had to leave immediately. He knew his wife was being held at the local police station, but judged it safest to take the children and go. The family, now reduced to 3 people, stopped at a town near Warsaw. They found rooms, and began living with new identities, on forged Polish papers. “We weren't in hiding. We were living there as Poles. I think my father convinced the people in the Polish underground that he had a Jewish wife and he was trying to save his children, because they were quite happy to help him,” Marysia explains. “Dad would get up every morning look out the window and say ‘We've got an extra day,’ because they didn't hunt for Jews during the day, only at night. So once the sun was up, we were safe for another 12 hours,” says Marysia. Their accents, looks and the Polish papers protected them. All three survived the war – Marysia, her brother Jan and their father. They still didn't know the fate of Marysia’s mother. When they returned to their village they learnt that she and the people arrested at the guest-house had all been executed at the police station that same day. “Dad found out where she was buried, where the nine people had been buried after the execution. He brought her remains back to our village for a proper burial but I can’t remember any of it.” Marysia pauses, in tears. “We had family in Australia and they wrote to us and said, ‘Who is still alive and who wants to come to Australia?’ And my father said to me, ‘You are going!’” Marysia recalls. Marysia migrated to Australia in 1948. She wanted to do medicine like her dad, or nursing. But she had no money to study, and no language either. Eighteen months after arriving in Melbourne, Marysia married Berek Segan, a Polish Jewish immigrant who had arrived before the War. She was 20, he was 32 and a successful businessman. “He didn't tell me the truth about his age. He was twelve years older. But he said it was nine years. He was still lying until very recently. But now he’s 98, he’s so proud of himself that he’s stopped,” Marysia said during out interview. Since then, Berek has passed away. May he rest in peace. Marysia with her husband Berek. He passed away about 2 years after this photo was taken. They had 3 children. Marysia learnt to cook traditional Polish Jewish dishes from Berek’s mother. By the 1970’s Marysia had become a Melbourne society hostess. Her recipes appeared in magazines like House and Garden, along with her advice on ingredients and presentation. After a few years, her father also came to Australia, with his new wife. Marysia got to meet her new younger sister, Eve. This is Marysia’s recipe for a Day and Night Cake, which has 2 layers, one light, one dark. 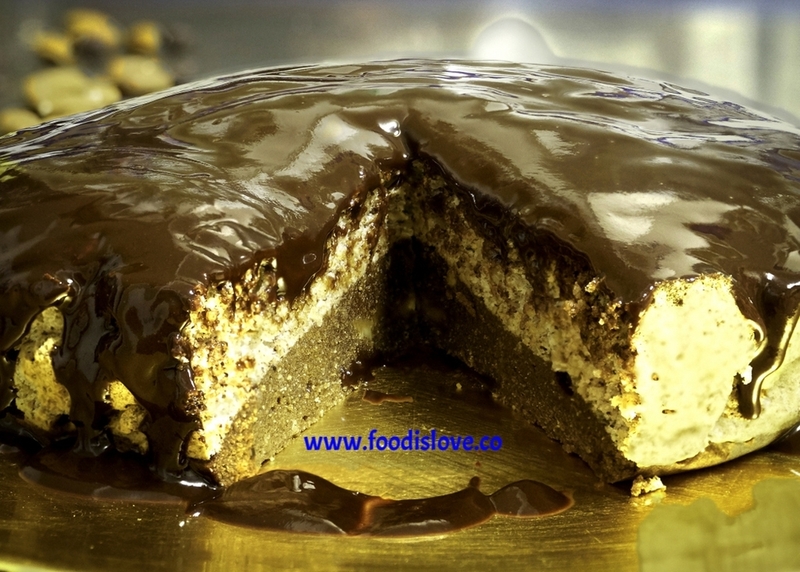 The ‘day' half (eggwhites and almonds) and the ‘night’ half (egg yolks, chocolate and hazelnuts) are baked at the same time, then covered with a chocolate ganache. Wonderful! The original recipe called for 250 g sugar - you definitely don't need that much. I made it with 200 g (one cup) sugar and still felt it was a bit sweet - after all the chocolate is sweet and the cake is also iced ... so I've reduced the amounts of sugar below to reflect that. Tip: It's best to use a smaller cake tin, say 7 inches / 17.5 cm. Although the recipe has 6 eggs, it does not make a huge quantity of mix, so a smaller tin gives you a taller, moister cake. Add hazelnuts and melted chocolate. (Let the chocolate cool a little so it won't start cooking the eggs!) Mixture will be sticky. Pour into buttered baking tin. This goes first because this mix is heavier. Beat 5 egg whites till almost stiff. 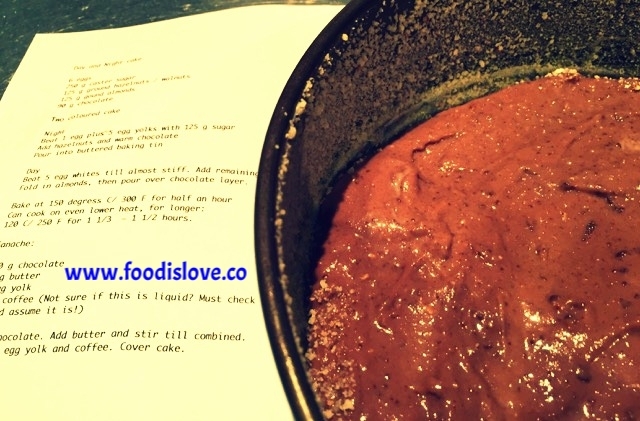 Add remaining 100 g / 1/2 cup sugar. Fold in the ground almonds, then pour over chocolate layer. Bake at 150 C / 300 F for half an hour. When cake has cooled, cover first with a layer of sour jam and then the ganache. Melt chocolate in a double boiler. Add butter and stir till combined. Stir in coffee and finally egg yolk. Pour over cake. You can also make a dairy free ganache using coconut milk. Instructions here, on the Food is Love Rugelach recipe page. Six decades after the war, Marysia was invited to Poland, to take part in the commemoration of the 1944 Warsaw uprising. She wanted to visit the guest-house where her mother had been arrested in 1942. But she couldn't remember the name of the Polish family who had taken them in. As she did with her mother's funeral, Marysia had blocked it. Her father and her brother had both passed away and there was no one to ask. She returned to Australia, bitterly disappointed. She did try to remember. For the next 10 years, nothing came. And then in 2014, more than 70 years after she had last seen them, she woke up one morning and their name was on her lips. At 85 it was safe to remember. Once Marysia knew the name, her sister Eve, a research whizz, tracked down the family. Amazingly, Janina and Leshek, the sister and brother who were Marysia’s contemporaries, were still alive and still in Poland, in fact still in the same village. In August 2014, during the northern summer, 72 years after she had last been there, Marysia returned to the village. She is aged 85, and Lech Rosciszewski aged 90 in the second photo! Marysia says she is still processing this visit, and the return to her past. But she often finds herself looking at the photos which the Polish family sent to her, taken during that lost summer of 1942. She says that perhaps some pain inside her has been eased as a result. How extraordinary that she has lived so long, and could wait all those decades to allow her memories to return. And at Food is Love we are processing this story and Marysia's recipes. Marysia's cake looks beautiful and has such a European taste -- I think it's the ganache! I've never added an egg or coffee to a chocolate cream before and both were great additions, especially the coffee. It gave it a slightly bitter, "adult" taste. The layer of jam is also a must in my view. This cake is rich and light at the same time - I know, contradiction, right? - and very satisfying. If you like you can have it plain at home, and then for an occasion "all dressed up" with the chocolate ganache poured over it. The hazelnuts in the chocolate 'night' half have a stronger taste than the almonds in the top half. I like the taste of chocolate and hazelnuts together, but maybe next time, in the interests of balance, I will try it with walnuts. In her gorgeous inner city kitchen, Judy Ingram baked this cake and loved it. "I used half maple syrup in the chocolate part instead of all the sugar and put in a tablespoon of bitter marmalade to add some orange flavour. Unfortunately the cake tin I used was too large (25cm) so next time I’ll use a smaller tin." "As I’m not a huge chocolate fan, I didn't put the chocolate ganache on it, just served it with a thick greek yoghurt mixed with a touch of maple syrup." VERDICT: The cake is delicious and I’d make it again. I personally like my not so sweet version as it’s rich enough with all the eggs and nuts. My husband Kevin loved it. Not far away, in another Sydney kitchen, Miyuki Mane made one main change: No sugar at all. She used a sugar substitute called stevia. She found an Australian product, Natvia which has zero calories, and comes as white crystals which you simply substitute for sugar in any recipe; on their website they say they use the "very best stevia, combined with a naturally occurring nectar known as erythritol." Miyuki also reduced the amount of Natvia she was using. "I reduced it to 100g for each filling instead of 125g and the cake was still sweet!?" "I tasted much more hazelnuts than almond, it is just because hazel has a naturally strong flavour? But it is a beautiful cake anyway so maybe that wouldn't matter." Miyuki was cautious with the coffee, putting only 2 teaspoons into the ganache. But next time she wants to use 3-4 teaspoons to up the coffee taste. "When we tried the cake my husband and son loved it. My husband gave me 8.9 out of 10 – the highest score he’s given a gluten free sugar free cake :-)"
Judy and Miyuki met and did a share and compare with their cakes. They found that changing ingredients makes a difference to the outcome - as does even the size of the baking tin. "They were totally different cakes!" says Judy. Day and night you might say. Miyuki used Natvia, Judy used maple syrup. Miyuki added the ganache, Judy didn't. Miyuki's was sweeter, dryer and higher than Judy's version. Sugar and egg white whipped together will make a meringue. Egg white plus maple syrup will have to work much harder - and often it won't stay airy. Bubbly Amanda Hampel in Melbourne was enthusiastic from the get-go. "When I told one of my friends about this week’s recipe, she said it’s a perfect Passover dessert! And it most definitely is :))"
And to end, a final photo of Marysia's family, before she was born, and before the War changed everything - for them as it did for so many other Jewish families in Europe. Marysia Segan's parents, Henryk and Regina, with her brother Jan, Poland, late 1920s.